Last week, the Illinois Attorney Registration and Disciplinary Commission (IARDC) issued a report that recommends allowing attorneys to participate in for-profit referral and matching services, and seeks public comment on a proposed framework for regulating for-profit referral companies and participating attorneys. The IARDC’s approach has been hailed as a favorable development by some, and for sure, the IARDC deserves credit for its exhaustive report and its open-minded approach to an issue that many other bars have rejected outright. With that said, the ARDC proposal is a very, VERY bad idea for the reasons discussed below. As I’ve argued before, platforms that match clients with lawyers in exchange for a percentage of the fee are no more of an unethical form of fee splitting than are credit card companies that take a percentage of fees paid by a client as processing charges. No regulatory has held that lawyers’ use of credit cards constitutes impermissible fee splitting between a bank and a lawyer, so how can a transaction on a platform — where a portion of the client fee icovers administratie and processing charges — be rationally classified as fee-splitting. 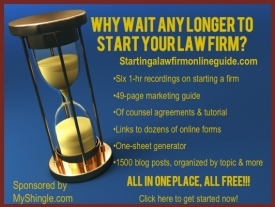 In a similar vein, most lawyer-client matching platforms are not impermissble for-fee referral services. In contrast to traditional bar-referral services which charge clients as a pre-requisite to providing them with the name of a lawyer, matching platforms are free. None of the platforms that I’m aware of require lawyers to pay money to acquire clients or recommend a lawyer in exchange for a fee. In short, neither clients nor lawyers pay to gain access to referrals – which is why it simply doesn’t make any sense to classify matching platforms as for-fee referral agencies. In fact, pay-per-click advertising – which the ABA has blessed as permissible more closely resembles a for-fee referral than an Uber-like attorney-client matching platform. Because platforms neither constitute for-profit referral services nor unethical fee-splitting, the state regulators have no business getting involved. To this day, Uber refuses to concede that it is either a common carrier or a taxi service. To do so would undermine its entire business model. If lawyers really, truly want to be like Uber, then we too ought to resist regulators’ attempts to elevate run-of-the-mill business models that consumers use in every other aspect of life into impermissible conduct that subject to bar regulation and oversight. Many companies that currently offer, or seek to offer lawyer-client matching services may be willing to accept Illinois’ approach in exchange for resolving regulatory uncertainty regarding the ethics of lawyer matching platforms. And a decision to accept some regulation in exchange for continued existence isn’t entirely unreasonable in a nascent industry where uncertainty can drive VC away. In fact, rumor has it that Avvo’s recent sell out to Internet Brands may have stemmed at least in part from concern or frustration over a series of adverse bar rulings prohibiting Avvo from expanding its lawyer-matching platform and market for flat fee legal services which in turn, chilled the company’s prospects for a public offering. But here’s the thing: this is not the time for legal matching platforms to throw in the towel. The Supreme Court recently held that professional regulatory boards don’t have per se immunity from antitrust actions. Bar regulators themselves recognize that that they stand just one antitrust action away from losing their power — and the IARDC’s approach represents nothing more than a desperate, band-aid effort to ward off the inevitable. Even worse, rather than limiting the bar’s reach, the IARDC’s approach would expand regulators’ turf even further – which would have detrimental consequences for the reasons discussed in points 3 and 4 below. In any event, a state-by-state approach is hardly a viable solution. State regulation of legal platforms will result in a crazy quilt of conflicting rules which increases compliance costs for matching platforms that are ultimately passed on to consumers. In addition, differing state regulations only confuse consumers who wonder why their relative in Illinois can hire a lawyer off of Avvo when they’re precluded from doing so in Indiana. One good swift federal antitrust lawsuit is all it would take to clear out state regulation in one fell-swoop and in my view, is a far better approach. To the extent that lawyer-matching platforms require regulation and oversight – and indeed, like any other consumer service they do – state regulators are simply not up to the task, as I previously discussed. Avvo alone generated 50 customer complaints to the Washington State Better Business Board in three years and that’s just one of potentially dozens of platform providers. Regulators can barely process consumer bar complaints against attorneys. Where will they find the resources to handle the additional workload of overseeing platforms? More seriously, regulation of platforms is a tricky business requiring sophisticated tools. Will the bar have the type of investigatory resources available to the FTC to investigate allegations that a site removed fake reviews in exchange for additional ad revenue from an attorney or allowed participants to pay for positive reviews? If a platform sells client information to attorneys willing to pay for it in violation of the terms of service, will the bar have the manpower to pursue claims for violations of privacy laws? Once the bars assume regulatory oversight of these platforms, the platforms will then turn around and claim immunity from FTC actions. The FTC is far from perfect, but it’s been regulating online sites for a decade or more and has resources and experience that bar regulators don’t, and will take at least a decade to acquire. Many professional regulatory boards operate independently and because of freedom from close oversight may be prone to bias or favoritism. State bar regulators are no different. Thus, they may be more likely to take action on a complaint against a platform by a prominent lawyer in the community upset about a poor ranking on the site, or to refrain from action by those platforms that offer substantial member discounts or large sponsorships to state and local bar associations. Frankly, I trust market forces more than bar regulators to pick winners and losers in a nascent multi-billion dollar industry. So what should the IADRC do instead of adopting this well-intended but dangerous proposal? Simple. There’s no need for amendments to Model Rule 5.4 or creation of frameworks that create added complexitiy and bureaucracy. Instead, the IADRC should issue a ruling holding that lawyer-matching platforms that take a cut of fees for administrative or marketing purposes are neither for-fee referrals services or unethical fee-splitting and are outside the scope of the IADRC’s jurisdiction. Problem solved. The IADRC is seeking comments on its proposal which may be sent to information@IARDC.com. No matter your position, please take the time to weigh in on this initiative.